Retirement villages: Nice places, but what's the catch? Spending our last days in a residential care home is something that few of us would relish. Last year the Burstow Commission called such homes "islands of misery". One alternative is the idea of retirement villages, common in the United States, New Zealand and Australia, but only now catching on in the UK. In such villages you buy or rent your own apartment, but have access to dozens of basic support and care services as you need them. Many older people who move in to such villages find the experience so positive that their final years are transformed. But, there is what some people see as a catch. The biggest bill only arrives when you move out or die. And since it will often run into tens of thousands of pounds, it can come as a shock for your next of kin. Unlike in a care home, retirement village residents usually buy an apartment on the site, although in some schemes they can part-buy, or even rent the property. Residents bring their own furniture, decorate as they wish, and are free to have friends and family come to stay. Most villages allow pets to come too. They can also pay for care and support services, which are on-site, as and when they need them. They can get help with everything from shopping, for example, to assistance with washing or getting dressed. 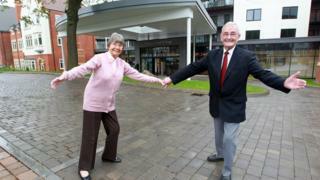 Pat Wood moved into Hagley Road Village in Birmingham two years ago, and loves it. "Whoever came up with the idea excelled themselves," she says. "In my mind it's what the future holds." There's a busy social scene here too. Activities include everything from tai chi to abseiling, while Kiki Dee will be playing in the bar in a few weeks' time. "Everybody talks to you. It's aptly named a village," says Pat. Apart from buying an apartment, and paying a regular service charge, residents are obliged to pay what is variously known in the industry as an exit or "event" fee. This becomes due when a resident dies, or moves on to full-time medical care elsewhere, and the apartment is sold. Some describe it as the "enjoy now, pay later" model. The exit fee depends on how long a resident has lived in the village, but is typically capped at 10% of the original purchase price. However in some cases it can be as high as 30%, after just three years. The Law Commission is currently investigating this issue, and a fortnight ago declared that such fees are causing "anger and distress". "Bereaved families inheriting a property may have no idea that a fee is due when they sell it, let alone how high the fee could be," said Law Commissioner Stephen Lewis. Among those unhappy are a former district judge, Alistair Bassett Cross and his wife, who moved into a retirement village in Hampshire. Three years later they discovered that, contrary to what they'd been promised, nearby farmland was to be developed. They decided to move out, but were hit with a 10% exit fee - in their case £54,000. They are currently taking legal action to try and get that money back. The charity Age UK says it is not always clear what exit fees are for. Some retirement villages say they provide sinking funds to maintain the buildings, while others say they are to cover the cost of selling the properties. In any case, Age UK claims they don't bear any relationship to the actual costs incurred by providers. "It's quite clear that that fee has been added on as profit - pure profit - as part of the business model they use," says Joe Oldman, policy advisor to Age UK. "That's what creates the confused picture here, because there are some exit fees which are very hard to justify." That is a charge vehemently denied by Richard Davis, the boss of a New Zealand company which is about to open its third retirement village in the UK. The latest, an upmarket venture, is in Battersea, south London. Its exit fees are as high as 30% after just three years. Someone moving out of a one bedroom apartment after that time would pay at least £195,000 to leave. But like some other operators, LifeCare Residences uses the fee to subsidise the on-going service charge. That means that both service and care charges are fixed when a resident arrives, and will never rise during their stay. "Yes, it is a higher number," Mr Davis admits. "But we're very much focused on that peace of mind, keeping the living costs low." One of the industry bodies, Associated Retirement Community Operators (Arco), says exit fees typically help to reduce weekly maintenance charges from £100 to £60. But its new code of practice, published just two weeks ago, recommends that providers are more open about charges before anyone moves in. "It's about clarity and transparency for the consumer," says Michael Voges, executive director of Arco. He says most of the Law Commission's criticisms were directed not at retirement villages, but at flats and sheltered housing projects, where leases more often contain nasty surprises. He also thinks that many people might prefer to pay an even greater proportion of their costs at the end of their stay. "You can have people on modest salaries, still having the bar, the gym and the craft room," says Mr Voges. "Deferred payment is one of the things that drives that." Paying less now, but even more later, could also suit an equity-rich, yet cash-poor, generation of British pensioners. Of course it might not suit their dependants - who would stand to lose more of their inheritance - quite as much. On top of that, although the Law Commission is telling the industry to be more open about its charges, so far it hasn't quibbled with the principle of exit fees. That is good news for providers, who need the confidence to invest in more projects. Others in the industry say that the more retirement villages we build, the more we ease the burden on the NHS to look after us in old age. By convincing more people to move into such villages, we also free up their empty houses for the next generation. Get used to exit fees. They are here to stay. But if you're thinking of moving into a retirement village, read the small print like never before.